Gamja jorim (potato side dish) used to be my regular lunch box menu. My mother sometimes added small dried anchovies and carrot, and sometimes she added ham cut into dice like potato. I used to make this all the time as my children’s lunch box side dish, too. The other recipe in this video is Gamjachae-bokkeum. Peel the 2-3 medium sized potatoes (15 oz :425 grams worth). Wash and cut them into ¾ inch cubes until you have 2½ cups’ worth. Put the potato into a colander under running water to remove the starch. 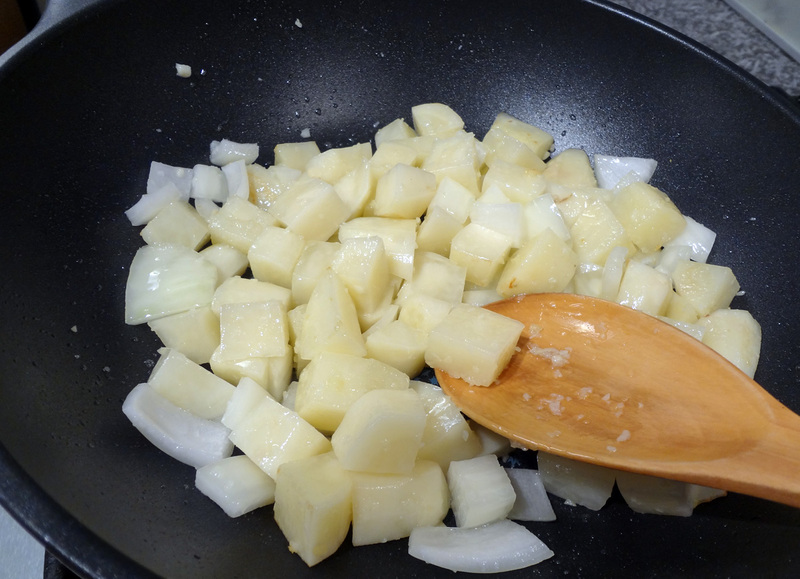 Cut ½ cup’s worth of onion into bite sized chunks. Set aside. Add 1 tbs olive oil to a heated pan. Put the potato into the pan. Add 2 cloves of minced garlic and sauté it until the potato looks a little translucent. Add the onion and keep stirring for a few minutes. 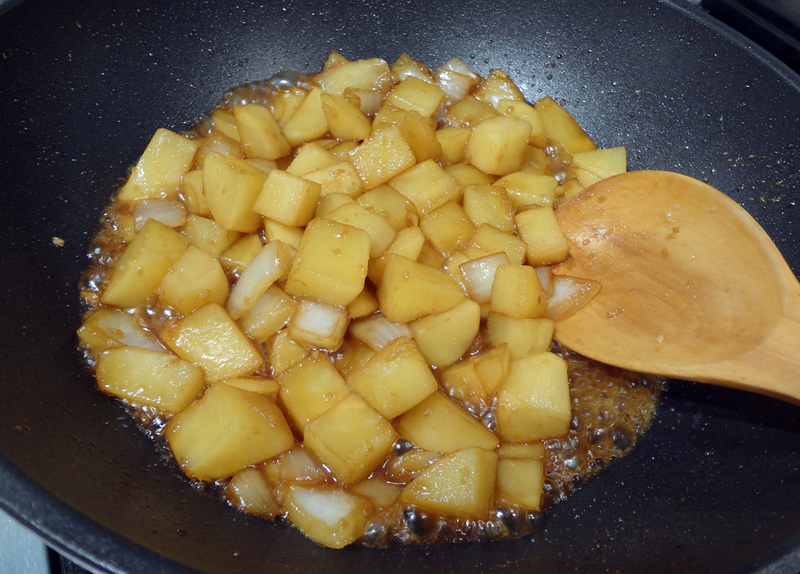 Add a half cup of water to the pan, 2 tbs of soy sauce, and 1 tbs of corn syrup (or sugar). Mix and simmer over medium heat for about 10 minutes until the liquid is evaporated. Keep stirring so it doesn’t burn. Add more water if it looks like it needs some. 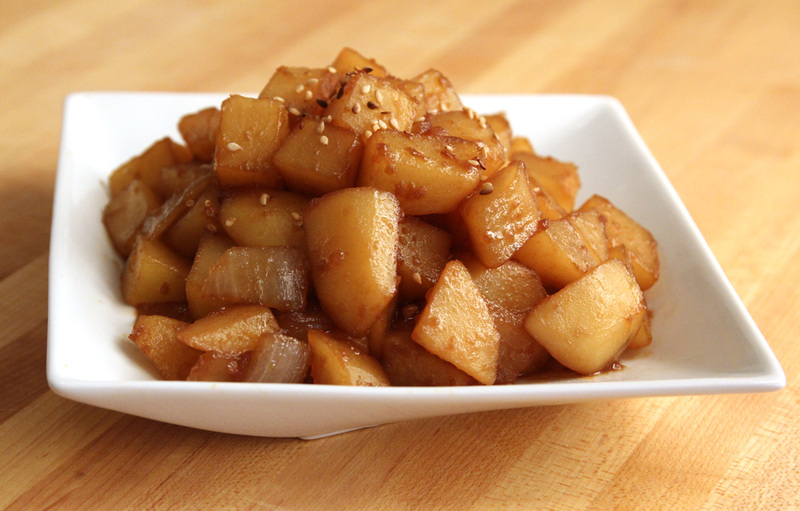 When the potato is cooked, turn off the stove and add 1 tbs of sesame oil. Sprinkle a pinch of sesame seeds over top and serve with rice. Posted on Monday, April 7th, 2008 at 8:47 pm. Last updated on October 7, 2014. The gamja jorim turned out soo good! My 5 year old daughter loved it. The potatoes have such a savory flavor and goes well with anything or by itself. Yay! It sounds like your cooking skill is already getting better. Gratz! hiya maangachi, i googled for potato salad and found this site. 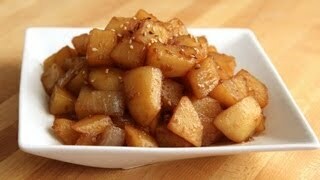 i am wondering do you have the recipe for a potato side dish which in dark soy sauce and sweet? i try in a restaurant before but that restaurant don serve it anymore and my housemate and i are craving for it… thanks.. I tried some of them, and it turned out really successful. 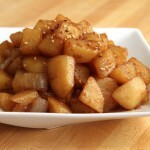 I was wondering if you can post some Korean Radish sidedish recipes. Have you checked my cooked radish recipe? More radish recipes will be coming in the future. 질문이 있어요. Whenever I make anything with potatoes like the two dishes you listed, my potatos always come out mushy on the sides. I try to fry it a little longer but it doesn’t look as firm as yours. I would reduce the cooking time. Hi Maangchi! I have been craving a taste of my childhood so from your website I am making yukgaechang, gamcha jorim for dinner, tonight. I have kimchi from the Korean market and some fried mondu will round out dinner. I am so glad to have found your website! Thanks so much! I’m so glad to be found by you! : ) It sounds like you have been cooking Korean dishes quite a lot! Yukgaejang is delicious, right? This recipe was originally posted on April 7, 2008 at 8:47 pm by Maangchi. It was last updated on October 7, 2014. The video was watched 818,904 times on YouTube & has 5,057 likes!